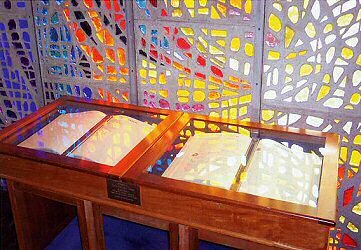 Books of Remembrance are positioned in the Chapel of Remembrance adjacent to the Garden of Rest. The Books are in four three-monthly volumes, covered in gold-tooled calf black leather to an approved design with a specially constructed binding mechanism. Inscriptions are added by highly skilled craftsmen and the Book will be open day-to-day at the appropriate page in order that the entry may be seen on each anniversary of the date of death and at other times by appointment. Relatives and friends may have a memorial entry of two, five or eight lines recorded in the Book upon request, at the standard inscription charges. Memorial inscriptions to deceased parents may be entered together on the page headed with the date of the wedding anniversary if desired. Coats of Arms, Floral Emblems or Service Badges, etc., may be incorporated alongside an inscription of five or eight lines, and details will be given upon request. The specimen page reproduced (in miniature), gives guidance to the type of entry usually adopted. (Further examples may be seen at the Crematorium Office). A white memorial card holds one inscription. This can be retained by family or forwarded to distance relatives. Specimens can be viewed at the Crematorium office. 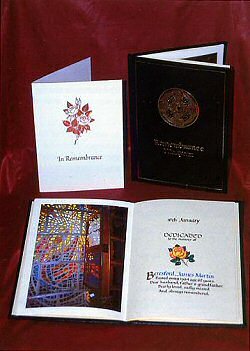 We have available a miniature Book of Remembrance. It is sufficient for eight inscriptions. Specimens are available at the Crematorium office.